PRESS RELEASE - JULY 1, 2010 - ATLANTA - The Atlanta Humane Society"s "Humane Emergency Animal Rescue Team" (HEART) is lending a hand to one of the largest feline rescues in St. Mary"s, Pa. The ASPCA (American Society for the Prevention of Cruelty to Animals) is currently finding means to rehome nearly 400 cats rescued from a sanctuary known as the Animal Friends of Elk and Cameron Counties. According to the ASPCA, the cats were found living in deplorable, overcrowded conditions on the first floor of a two-story commercial building about 120 miles northeast of Pittsburgh. The rescue operation was set in motion by complaints regarding the conditions of the facility. Being well-aware that space for cats during this time of year is stretched thin, the ASPCA immediately set out to partner with the Atlanta Humane Society. As one of the top 10 largest Humane Societies, Atlanta dedicates a small section of assets to assist in national humane emergencies. Director of Animal Welfare Initiatives, Miguel Abi-hassan stated "The ASPCA is a great partner in fighting cruelty. They have been there for us in many occasions and we"re happy to lend a hand. In the plight of animal welfare we know that helping each other is the only way to prevent cruelty." According to Abi-hassan, most of the cats Atlanta will help place are adults, and include the full array of colorings, markings and personalities. "Most of these cats will be available immediately upon arrival July 2nd. However, because we observe the July 4th Holiday, we would like to encourage potential adopters to come Saturday, July 3rd or anytime next week. " Abi-hassan insures that the selection of cats in the newly revamped "Cat Room" will be second to none. All cats or dogs adopted from Atlanta Humane Society come fully vaccinated, sterilized, microchipped, health guaranteed and with 30 days of pet insurance. 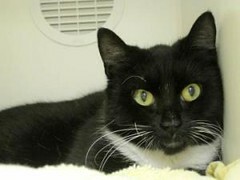 Cat adoptions are only $85 and you can always get 2-pur-the-price of one. Free giveaways will be given to the first 50 adopters. Founded in 1873, the Atlanta Humane Society and Society For Prevention Of Cruelty To Animals, Inc. is the oldest private non-profit animal welfare organization in Atlanta and one of the oldest humane agencies in America. Services such as adoptions, charitable veterinary clinic, pet facilitated therapy, animal behavior hot-line, low cost spay/neuter services, a regional pet food bank and canine play yards are possible by generous contributions of time and money from the public. Our mission is to prevent neglect, abuse, cruelty and exploitation of animals and to assure that their interests and well-being are fully, effectively and humanely protected by an aware and caring society. For more information about the Atlanta Humane Society, visit the website or call 404-875-5331. The Atlanta Humane Society is located at 981 Howell Mill Road. Animals can be adopted from 10 a.m. until 6 p.m. on Saturday and from 11 a.m. until 7 p.m., Monday through Friday. Click here to read the ASPCA Press Release on the underlying rescue operation in Pennsylvania. Photos of cats currently available at the Atlanta Humane Society courtesy of Petfinder.com - Chubs MaGee (gray and white tabby) and Whiskers (black and white).